I know this first one is going to look a bit like a large wall of text, I'm sorry, but there's not much to show off in pictures when it comes to interface. There will be plenty of pictures later, though. This tutorial will cover both beginner and advanced methods for the majority of things in the level editor. Even if you have no experience with modding, you should be able to follow these tutorials. If you can't, either you skipped a section of the tutorial, or there's something wrong with my tutorial. You can PM me on the FG forum (Kiandra) and let me know what I need to clarify. For the sake of not swamping everyone with everything, I'm going to start with the absolute basics. If you haven't downloaded the level editing suite, you can do so here. There are adequate instructions on the linked page on how to download and install the editing suite, so I won't be covering that in this tutorial. If you wish to add to this page or would like to see your tutorial in the Useful Links Section (coming soon), feel free to edit this page and give yourself credit. Just try to stick with the same format used by the rest of the tutorial. Okay, so I'm hoping you know where the level editor is. For windows users, like me, it's C:/Program Files (x86)/Amnesia - The Dark Descent/redist just double-click on the level editor application not the PDB file to get started. So what is this thing, exactly? It's a lot of buttons! We'll go through each one of them in a bit of detail. Don't panic about needing to know all of them right off the bat, I'll refer back to the hotkeys and appearances of the buttons every time they're used in the basic tutorials. You'll become more familiar with them as you use them. As we go through them, I will start with the buttons in the left side-bar and move counter-clockwise to the bottom bar, then right side-bar, then the top menu. It would be beneficial if you follow along in the level editor and click on the buttons or press the hotkeys when they're mentioned. Don't worry if your screen doesn't look exactly like mine. I have the perspective viewport enlarged (you can do this by hovering your cursor over the bottom right quadrant and pressing spacebar). To enlarge the pictures beside each tool, you can right-click and select Open Image in New Tab. We'll go over each of these buttons in more detail as they become relevant. What it does: The stream-like things coming from the window as displayed in this link. What it does: Brings up a menu on that large blank right-hand column which will let you place in objects that cannot be interacted with, such as walls, pillars, door frames, stairs, and railings. 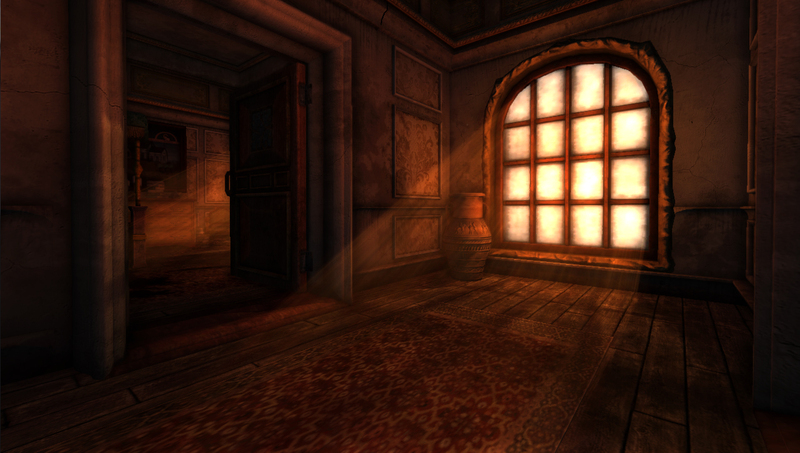 What it does: Toggles the global pointlight; this one enhances normal maps. Translation: it makes flat things look 3D. Button Appearance: The faded buttons which become more distinct when a clip plane is created. We'll go over these in detail later. What it Does: There are several functions. The Skybox menu allows you to select a skybox. Indoor maps do not need skyboxes unless the windows are transparent. It's just a waste of memory. Fog toggles the global fog and all its variables. It's like a never-ending fog area. Decals changes the maximum number of triangles allowed in your decals. Translation: changes how much memory and how complex your decals are. What it Does: allows you to change certain level editor options. These are handy for making the level editor actually fit your screen. What it Does: Opens a previously saved .map file, including those made by FG. Go take a look at them some time; they're useful case studies. What it Does: Saves your map under a different file name. If you mess around with someone else's map (which is not okay without their permission), always save as something else before making any changes. That way, you don't do what I did and delete the entire Cellar area of ATDD (I was experimenting with lighting). What it Does: opens a drop-down menu of recently saved maps. If this is your first time on the level editor, the menu will be blank. What it Does: Closes the level editor; it will always prompt you to save before it closes. This isn't too bad; you'll be moving around a lot, but give it a try while I explain here anyways. Currently, there should be fourdifferent views on your screen. Starting in top left, moving counter-clockwise, they say Front, Top, Perspective, and Right. I've never found much use for Front, Top, or Right. You can zoom in on specified screens by pressing spacebar while your cursor is hovering over it. You can also press spacebar again to zoom back out. If you're following along, highlight the perspective screen and press spacebar to magnify it if you haven't already done so. This is more useful than zoom in a lot of cases. Click and hold down alt and the left mouse button; you should notice the border of your screen turned from red to yellow. Move your cursor like you're dragging the screen around - the same way you would if you were to put your finger on a piece of paper and rotate it. The second most useful button. You can get by without pan if you're creative with the focus tool and tracking grid (which is what anyone without a middle mouse button is going to do). Hold down alt and the right mouse buttonthen move the cursor upto zoom in, down to zoom out. Hold down alt and the middle mouse button, now move the cursor in any direction. From what I've seen of other people using the level editor, using pan is like placing your finger on top of a sheet of paper and pushing it around to view different parts - like the hand tool in Photoshop. I'll try to keep this from turning in to a "do this task and then good luck" tutorial (unlike its previous unedited version). Instead, let's think of what any map is going to need. Since Amnesia is generally made from indoor environments (and outdoor environments are my downfall), let's pretend this is some sort of indoor room. So first, we should start by figuring out how big our room will be. I'm going to just make an 8×8 room (each wall piece has a length of 4 in the level editor). At this point, I would like to recommend that you start off making a small room. While large room can look very impressive, it is much more difficult to make them actually look interesting and not empty. What I consider 'small' is anything between 2×4 room (smallest possible room with a door) and 12×12. To start building the room, press 6 or go to Static Objects (the lego brick in the left bar menu) and click the drop-down menu above the large white box. This will allow you to choose a base to work with. Personally, I find the mansion and castle bases easiest to work with because they have the largest variety of uses, but choose one that you would like to work with.